Long ago, the Thai migrated from China, and like the rest of their culture, their cuisine evolved from Chinese foundations. But to traditional Chinese dishes, the Thai add lively flavorings. In each appetizer, side, soup or entree, they try to balance sweet, sour, salty, bitter and heat. The result is a cuisine MUCH livelier than Chinese, which the Thai consider bland and boring. They keep the Tea and Rice from Chinese cooking but add Lemongrass, plentiful in the more Southern Thai countryside. The Thai brought the Wok, Deep Frying and Stir Frying from China, and use lots of Noodles and Soy. In Thailand, the fork is used by the left hand to place food in the spoon held in the right hand. They rarely use knives. 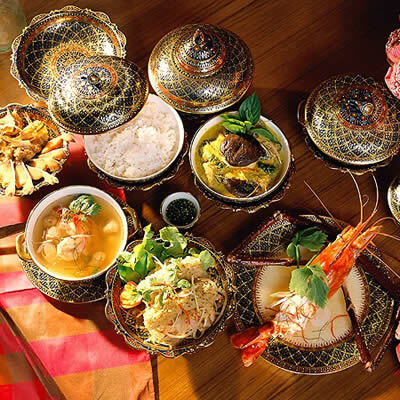 A traditional Thai meal will be either a large bowl of Soup, or a series of six or seven smaller bowls of varying ingredients. Sauces are EXTREMELY important in Thai cuisine. 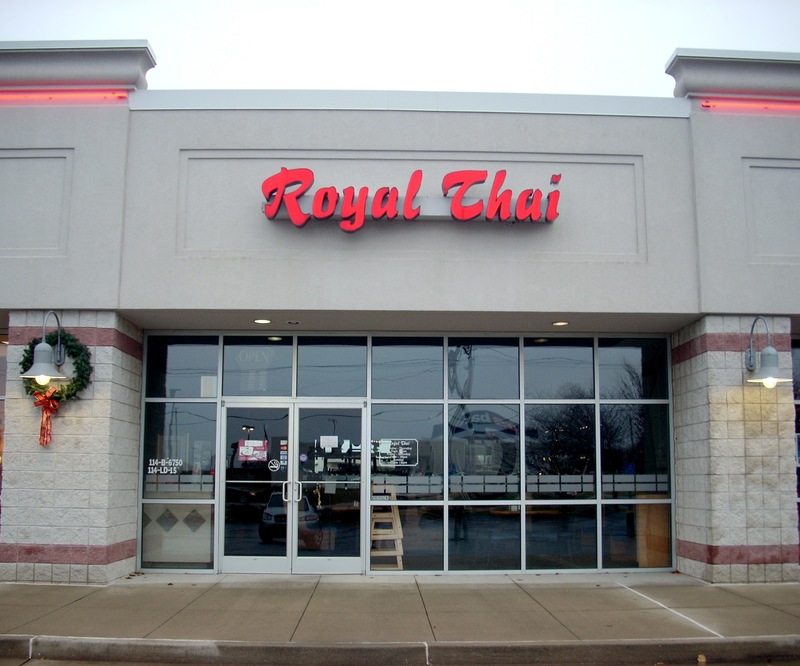 Do not let Royal Thai's Cave Mill storefront appearance dissuade you. Inside, this is a large, classy restaurant with a state of the art Thai menu. 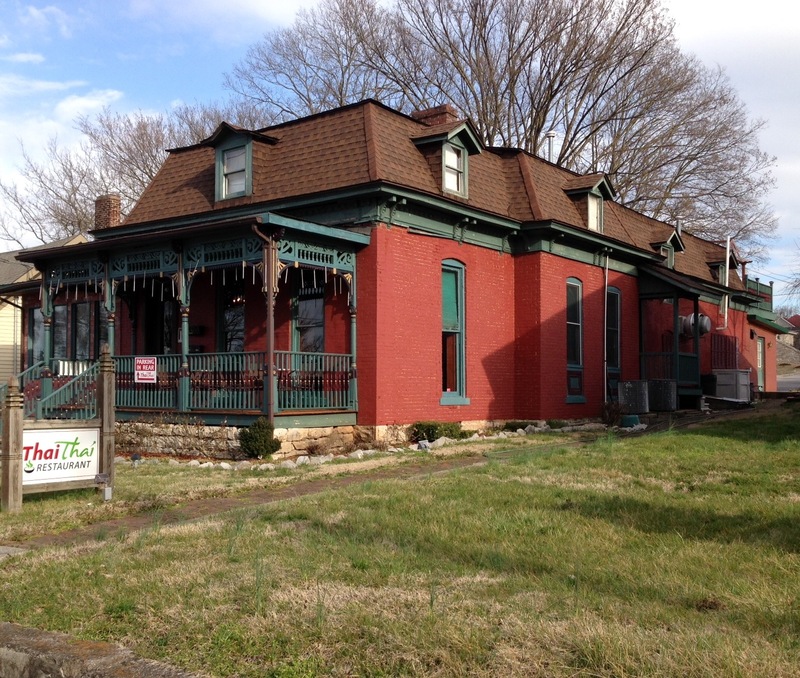 It's one of five locations run by Nita and Woody Sirayutwatana, who started in Nashville in 1994. The menu is a fire works display of exotic tastes and textures and on your first visit you'll have a hard time choosing. Among the 13 Appetizers, we like their Steamed Dumplings (filled with minced pork and shrimp), Keow Todd (fried won tons filled with shrimp), and the Combination Platter. We are great Soup fanciers, so we love the Thai soups, beginning with their traditional Tom Ka Gal (coconut milk, chicken and mushrooms). But the Tom Yung Goong is the Thai version of Hot & Sour Soup (with shrimp, lemongrass, lime, mushrooms and tomatoes) and is delicious. They also have Wonton Soup, Salmon Soup and Poh Taek (Seafood Medley). There are seven salads, of which our favorites are the Sua Rong Hai, a toss of beef medallions, chilis, tomatoes, cucumber, onions and lime, and Yum Pla Duk Foo, quick deep fried catfish with chilis, scallions, cilantro, lime, and green apple slices. They offer Seafood entrees (scallops, crab, squid, shrimp, tilapia, snapper, catfish and mussels), five Curry sauces, and four Vegetarian entrees. There are also Roast Duck (outstanding), Lemon Chicken, and Pepper Steak. The Peanut Sauce is excellent. Weekend evenings can get a bit crowded so we advise you go early.